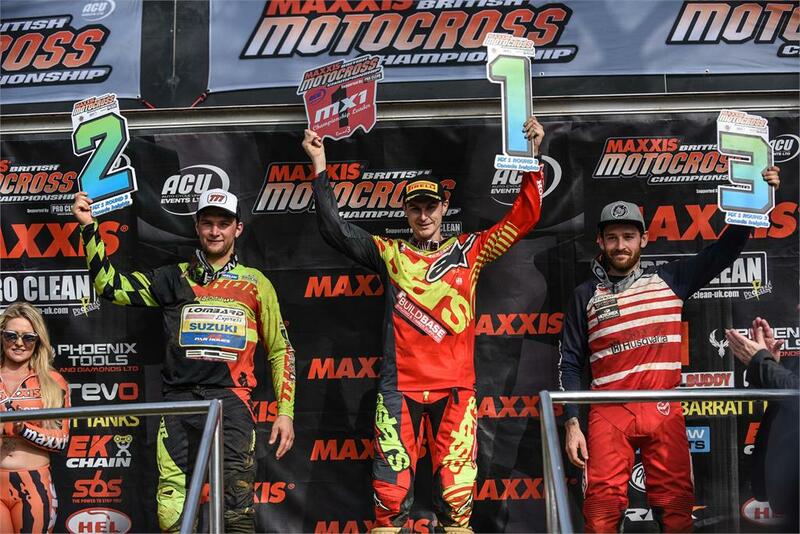 Evgeny Bobryshev raced his Lombard Express with Par Homes Suzuki RM-Z450 to second position overall at the weekend’s Maxxis British Motocross Championship race at Canada Heights in Kent in the UK. The Russian rider took Pole Position to give him the first gate-pick heading into the first MX1 race of the day in his first visit to the circuit. He opted for the inside gate to and started the race in second place, just behind a hard-charging Jake Nicholls. Three quarters of the way around the first lap he was knocked-back a spot as Elliot Banks-Browne used his local knowledge to find a line to move in to second place, but over the next 10 minutes, Bobryshev started to get on better with the hard and rutted circuit. He put his head down and slowly started chipping away at the small gap Banks-Browne had opened. Then, 15 minutes into the race, Bobryshev crashed as he was challenging for the lead but was able to remount quickly, only having lost a couple of positions. Unfortunately, his bike was bent and twisted which meant he had to make a hasty pit stop to sort things out. By the time Bobryshev re-entered the race circuit he had dropped down to seventh position. In the final laps of the race he was able to climb back through the field whilst fending-off fierce attacks from behind by Brad Anderson to finish the race in a respectable fourth position. Race two was far less eventful for Bobryshev. He began the race in second position before the fast-starting duo of Jake Nicholls and Elliot Banks-Browne dropped him to fourth place on the opening lap. Nicholls and Banks-Browne were able to make quick work of holeshot man Erkl Kahro to open a gap over the rest of the field. It took Bobryshev another half a lap before he could make a pass stick on Kahro. Once again, Bobryshev would have to put his head down and focus on reeling in the leading pair. It took 10 minutes before he found himself in a position to make a move on Banks-Browne for second place. ‘‘Coming into Canada Heights everything was new for me, I’ve never been here before. All day I struggled to get on with the track, especially as it got rougher and rougher, and it was super nasty in the second race. I managed to get Pole Position in qualifying and I started the first race in the top three. After about 10 minutes I came off my bike and had a big crash. I damaged my bike and I hurt myself a bit, so I had to enter the pits to straighten my handlebars and front wheel. When I got back on track I was in seventh position and I was only able to get back to fourth place. I was happy just to walk away from that with no injuries, just a couple of pains on my body but nothing too serious, so that’s good. “The second race was way better. I was in third on the first lap and I eventually managed to move into second. By that time Jake had a gap of maybe seven seconds already. He was riding good today, he had good speed, good lines and I just couldn’t get any closer. So, I just finished the moto in second position to get second overall. I was trying my best today and I managed to make the podium so that’s all positive. ‘‘Today was very good for us, Bobby’s riding is at a very good level at the minute. In the first moto he was just coming on to the back of Banks-Browne when he lost traction on the face of a double jump which caused quite a big crash actually, I witnessed it and it was a big one – a real cartwheel job! The bike was pretty smashed up, the radiators and the handlebars were all bent but fair play to him he came into the pits and straightened the bars before he went back out there. He was able to make up two places in the last couple of laps, so fair play to him. We know what he’s like, he’s a strong guy. Report and Images: Toofast Media Group.